Unexpectedly, a Hyatt Regency marketing director found himself alternating between elation and despair. Due to Hyatt’s recent partnering with Starbucks, his guests would soon be sipping fresh-brewed Starbucks coffee from his Hyatt cups. That was the good news. Unfortunately, he had no way of telling them that — because he had no Hyatt/Starbucks advertising materials. Absolutely… nothing. And no way of quickly generating them through normal corporate channels. So he turned to Shirley/Hutchinson. And he got an order of hot, steaming Starbucks creative to go. 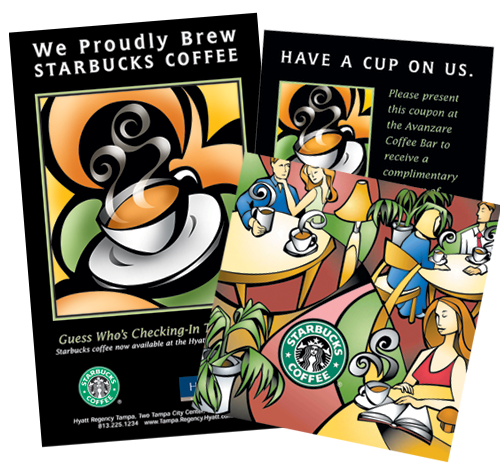 Shirley/Hutchinson quickly crafted a coordinated, original Hyatt/Starbucks promotional campaign, including everything from in-room stand-up cards and street posters to coupons, loyalty cards and a wall-sized mural. The centerpiece is an ultra-stylized piece of original art evoking the free-spirited, laid-back feeling of Seattle-based coffeehouses. A perfect match for Hyatt’s up-scale patrons and Starbuck’s gourmet appeal. Did it work? As soon as this campaign appeared… sales tripled.